The MP12N Stand Alone Compact Controller is user-friendly with comprehensive integrated storage management for article numbers, inventory and data fields. This can operate without any computer linked to it. Integrated FTP client for data exchange. Integrated web server enabling data to be stored via the intranet/internet. 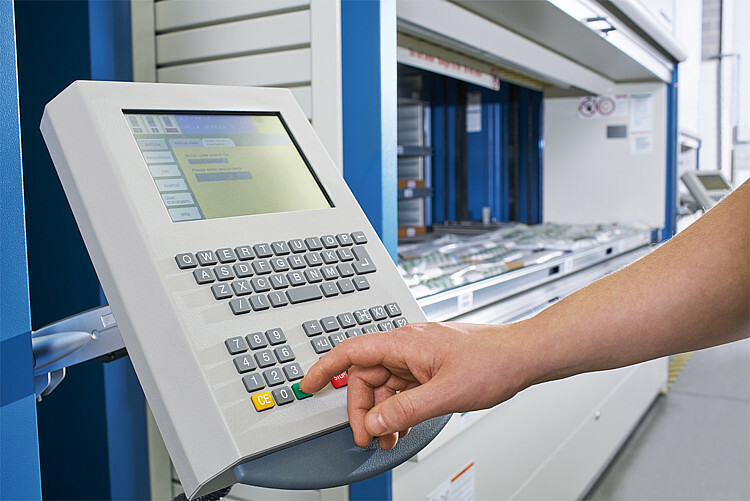 The control keypad with touchscreen operation offers optimal ergonomics for processing jobs. The pick and put orders are generated in the storage management system and passed on to the warehouse in data form. Route-optimised processing of orders across multiple Hänel storage systems. Data is exchanged between the lifts via FTP file transfer. Controller buffers up to 5,000 list items. The MP12N-HostCom storage management is performed in the higher-level host system. Lifts are controlled by external management systems. For storage and retrieval, a drive command is sent to the lift controller by the storage management software. Operated via the familiar user interface of the storage management software. Interface between storage management software and lift is reduced to a few commands using a TCP/IP connection. Control point for the lift can be a fixed PC or a mobile terminal. The MP12N-HostWeb brings the user interface of the storage management system directly to the lift, with virtually no limitations to the way the user interface is designed. Customer solutions can be individually implemented by a web server. Customer solutions can be individually implemented on the control terminal by means of a web server. There are virtually no limits to the way the user interface is designed. File interface for storage and retrieval orders. Data conversion and automatic, time-controlled data exchange.